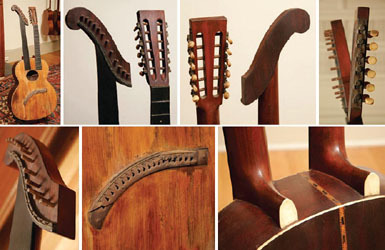 Welcome to another obscure, but valuable, part of American harp guitar history. As with so many articles and studies on this site of rare instruments and even rarer musician biographies, this story appears solely from the courtesy and help of the granddaughter of the subject. Her name is Renee Ball, and her grandfather was George Dudley, one of those prolific and famous harp guitarists that somehow completely escaped the history books. Which is both disappointing and surprising. For one thing, he may have been the first harp guitarist ever recorded – and, unlike most vintage American harp guitar recordings, we can hear the sub-basses. Perhaps his anonymity was a result of the simple logistics of the new group Ossman created in 1906, when Ossman formed a trio with two established entertainers, the Dudley Brothers (Audley and George). 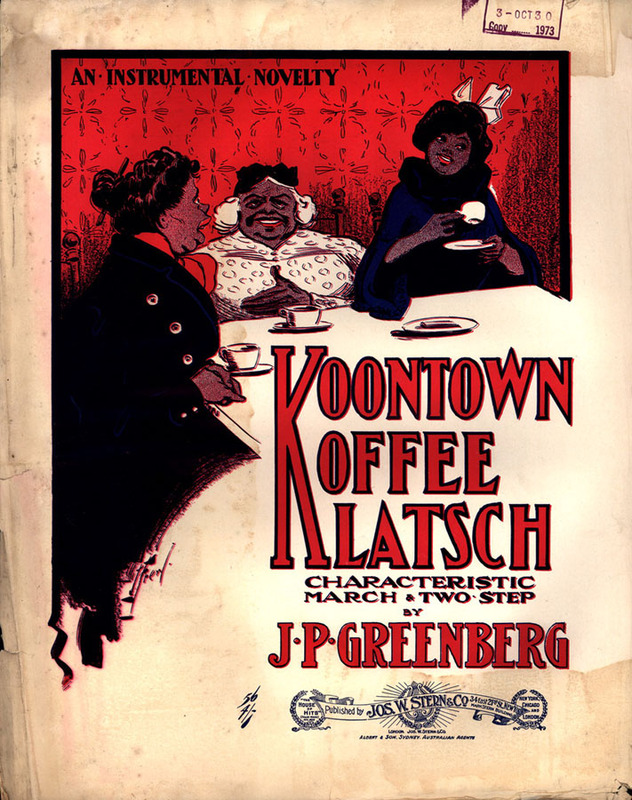 As they were worthy of billing, their names were naturally used…but as they shared a last name, used necessarily only once! And so, the curiously named “Ossman-Dudley Trio” came into being. This was the topic of my Oct 28, 2010 blog, “A Two Person Trio?” – which I’ll paraphrase next. A hundred years ago, the Ossman-Dudley Trio recorded a few sides with harp guitar accompaniment. I remember it occurring to me that the name read pretty strange, and over the years, I never resolved it. Everyone knew that the “Ossman” was Vess Ossman, the “Banjo King” of the turn of the last century. The “Dudley,” it seems, was unknown until more recent times. 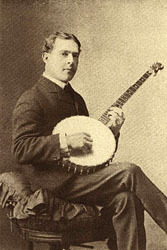 He turned out to be one Audley Dudley, who played mandolin on the recordings. The identity of the harp guitarist, the fellow that made it a trio – George Dudley, has been virtually unknown. After all, what are the odds of having two brothers as part of a trio? And having this line-up, should they have just called the group “the Ossman, Dudley & Dudley Trio”? I guess that does sound a bit redundant. So the Dudleys were listed just once, and it was left to the public’s imagination as to why two names equaled a trio. Thus, Audley and George were relegated to “mystery men” to all except audiences who might have seen them at a live gig. The "mystery" which for years has surrounded the Ossman-Dudley Trio in the minds of thousands of record collectors will be a mystery no longer. Vess Ossman's partners in the trio were two brothers. 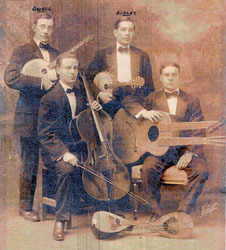 Audley Dudley played the triple-string mandolin, and George N., the harp-guitar. And there, with the addition of the immortal Sylvester Louis (Vess) Ossman, you have the Ossman-Dudley Trio! Now that I look back on the mystery which is a mystery no longer, I wonder why it never occurred to me that there might be two players named Dudley in the trio. 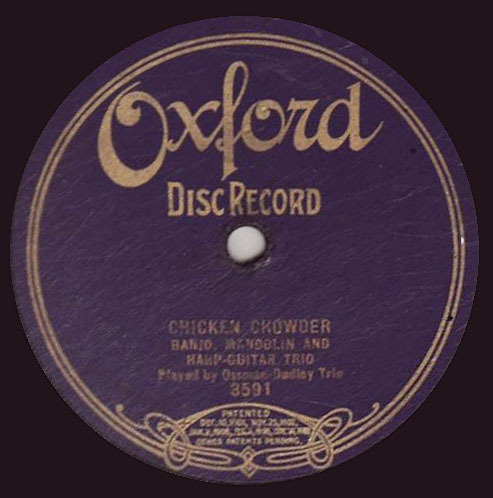 In reading the piece, I realized that A) It was a big mystery to record collectors and early banjo fans in 1953, and B) it has remained a mystery to all but a couple of diehard record collectors. In fact, in checking Wikipedia as I publish this article, no one yet mentions the harp guitarist. Googling again specifically for “George Dudley” + “harp guitar”, I found that someone in the interim (after 1953) did become aware of the guitarist George Dudley, and speculated that either Dudley or Roy Butin was the harp-guitarist in the trio. This short statement has been duplicated in several articles, perhaps copied from the first writer. Walsh, in 1953, had guessed either Roy Butin (who “forty-odd years ago, was probably the best known guitar player in America”) or Parke Hunter, a multi-instrumentalist and frequent partner of Ossman’s. In digging deeper, I recently learned that record collector Mark Berresford knew, and disclosed, the names of Audley and George Dudley in his 2001 CD release From Ragtime to Jazz, Vol 3. And I found that the Encyclopedic Discography of Victor Recordings website at UCSB also lists George Dudley (without the “or Roy Butin”). But until now, I have found virtually zero information published on either George or the Dudley Brothers, nor a single image of them. Hopefully, this article will contribute to the information trickling out amongst interested scholars, record collectors and fans. I find it odd that the Dudley Brothers remain all but unknown, as they were well established, popular entertainers even before Ossman came calling, and subsequently after. 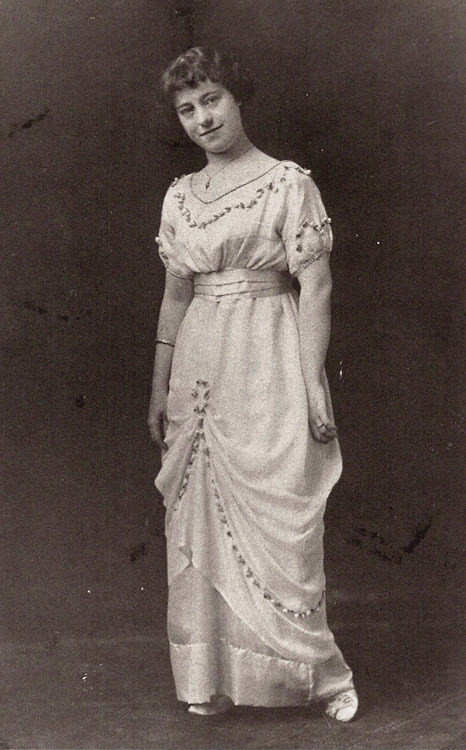 The relatively scant, but valuable, information we have on them comes from interviews and a memoir from George’s wife, singer Florence Taylor Dudley. Her excellent recall is displayed first in the lengthy 1953 article by Jim Walsh. And in the next chapter, we have her own unpublished short autobiography, shared with the public for the first time here on Harpguitars.net. 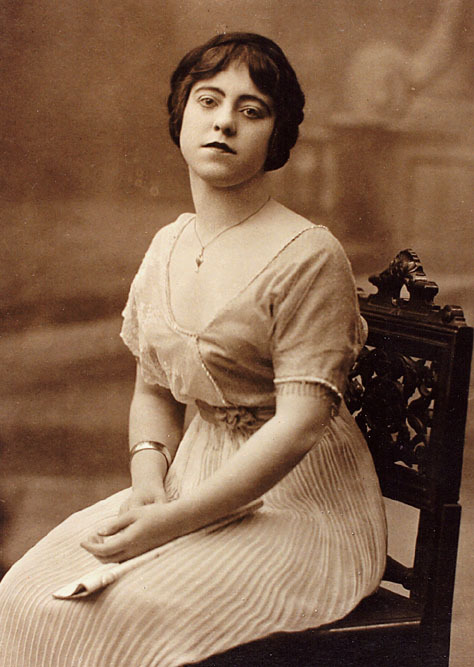 I was particularly entranced to read how young Florence toured with the equally young (then) Marx Brothers before they became Vaudeville stars. If only she had written more, and earlier, on this period! 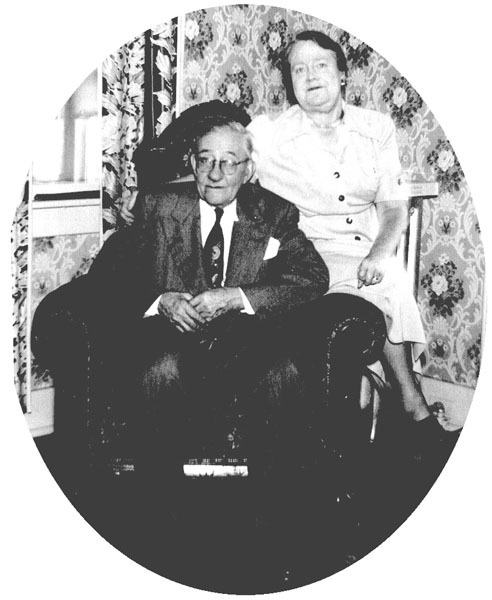 George Nabb Dudley was born on April 24, 1875 and died on April 28, 1963. Florence passed away in 1969. George’s brother Audley had passed away in 1916, due to tuberculosis. After his death, George lost the desire to entertain, but his wife talked him into performing again on the radio in the early 1920's. He and Florence then moved to Long Island around 1930, thus ending their careers. It’s interesting that even now, only a handful of die-hard record collectors and researchers know the identity of George Dudley. I would suggest at this point that you click on the link at right, and first read the Walsh article. Renee Ball, who, as you read in the Walsh piece above, was the youngest of Florence Dudley’s four granddaughters, now shares the following personal document of her grandmother’s. It was written as a memento to the family in June 15, 1967 (typed up later by one of the granddaughters), and, like her recollections in the Walsh piece, offers a rare first-hand account of this bygone era. Note that Florence refers to her husband as “Gramps,” as she is addressing this as a letter to her granddaughters. Did your brain do a double back flip? Mine also. I logically assumed that it was either a typo, a mistake, or just misconstrued word of mouth. And the quartet image in the poor Xerox of the Hobbies article didn’t tell us a thing. Luckily, Renee had a better copy of that image, and a second, better photo of the same instrument. Now we see that the unusual instrument had twelve strings on the neck (6 doubled courses). But how many sub-basses? Well, we can pretty easily count twelve, but look closely at the details. Is it possible that there are actually two rows of 12 zither pins for the chromatic sub-bass bank? I feared I wouldn’t be able to identify the builder, but then I dug up these photos sent to me by Mike Fleming, who photographed this instrument at Fred Oster's Vintage Instruments for a Fall, 2008 Fretboard Journal article. 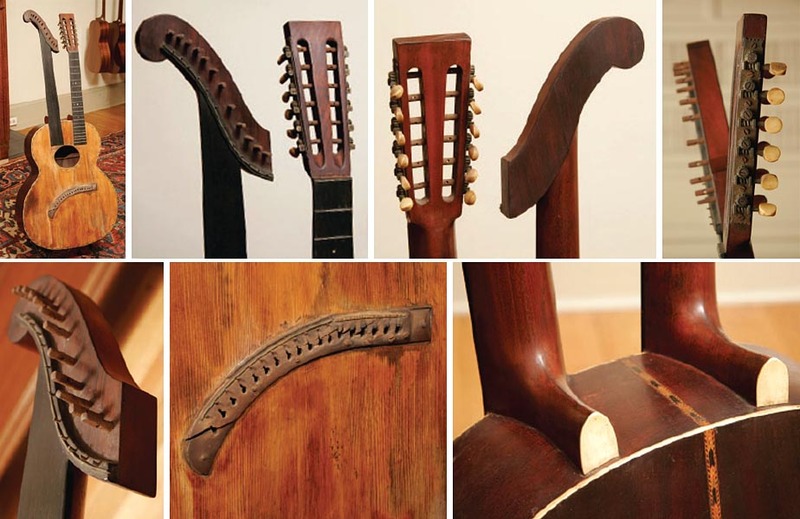 It is an ultra-rare (only one, as far as I know) Holzapfel & Beitel harp guitar, with – guess what? – 12 strings on the neck. This one has a full 12 bass courses also, but they are not doubled. Every other particular seems to match: bass head, placement of the necks, bridge, body and fretboard particulars (Dudley’s are bound and have fancy markers), you name it. I believe that George Dudley owned – perhaps custom ordered – the world’s first (and likely only) fully double strung 36-string Holzapfel & Beitel harp guitar. "Music Trades in 1900 (I didn't record the month, so perhaps the MT Annual) had an article about Holzapfel & Beitel building 'large 24 stringed guitars and 12 stringed mandolins for The Hollywood Mandolin Orchestra' of Baltimore. They were probably 12 stringers, not 24." In fact, it is no typo – The Music Trade Review was almost certainly announcing the very instrument shown above! The term and concept of string “course” (paired or tripled strings played as one “note”) remains confusing today, and was completely ignored a hundred years ago. So it was up to the reader’s imagination as to how Holzapfel & Beitel’s “24-string guitar” might be configured. And who at the time would have imagined such a cutting edge instrument as a harp guitar with twelve sub-basses and doubled neck strings? In fact, if Holmes’ date is correct (and you can usually take Michael’s notes to the bank), then this is important new information for both this article and my 12-string article. 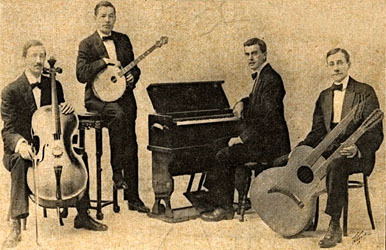 The firm of Holzapfel & Beitel, a very obscure name today, is known mainly to a handful (but growing number) of 12-string guitar historians and enthusiasts. 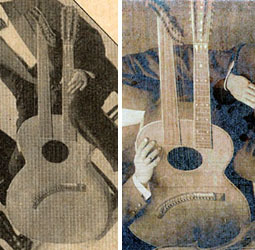 As demonstrated in my 12-string article, the firm may very well have built America’s first 12-string guitar (1901-1902). What I’m suggesting now is that their first experiment could have actually have been a 12-strings-on-the-neck harp guitar. Think about it. 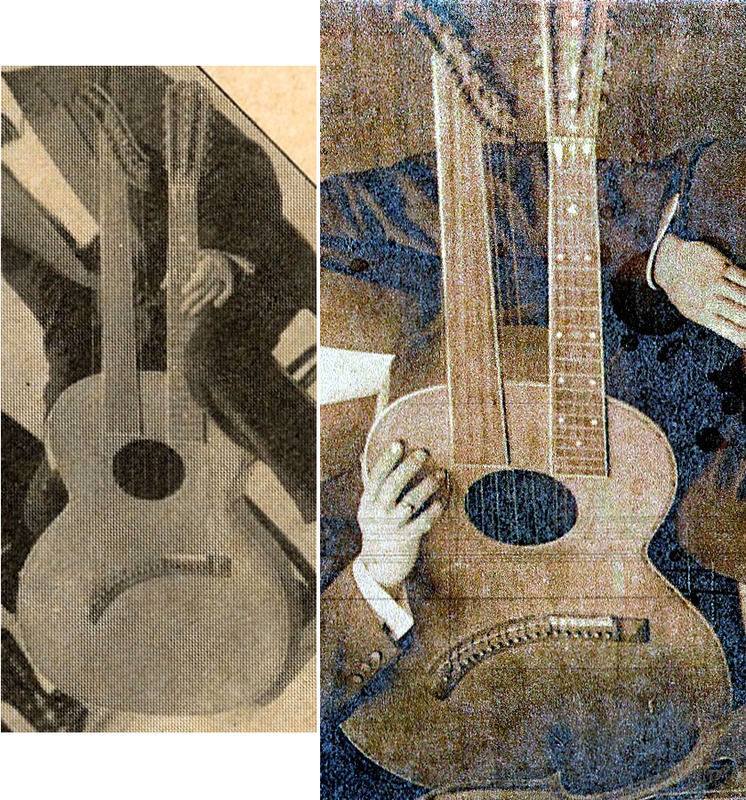 One of the main ideas behind American harp guitars was bigger + more strings = more volume. Doubling the neck strings would have been an easy way to get even more volume. And so it would not surprise me in the least if the “birth of America’s 12-string guitars” wasn’t jump-started with harp guitars by Holzapfel & Beitel and other builders (many pre-1920 harp guitars with doubled neck strings by different makers are known). And so they did. Dudley’s instrument then could have been built as early as 1900, or at any time Holzapfel was in business (with, then without Beitel), up until the date when the photos above were taken. I suspect early, as Dudley’s 36-string so closely resembles the extant 24-string Holzapfel & Beitel harp guitar, and that instrument matches the description in the c.1900 Music Trade Review ad. As a side note, the 12-string mandolin (triple-course) that Audley was described as playing in the Walsh article was quite possibly the “12 stringed mandolin” also listed in the c.1900 Holzapfel ad. On this sample of Chicken Chowder, you can easily hear George hitting a low B, A and later a D (assuming the song pitched in E). On all other songs with available sound samples, you'll always hear at least 1 sub-bass, usually a B or a D, once even a chromatic Eb. However, I'm not hearing doubled octave strings. In fact, on any Ossman-Dudley recordings, does anyone hear octaves on any notes; neck or subs? I can’t hear them, though of course recording fidelity is problematic at best (I’ve learned that the only real way to listen to 78’s is “live” on a great 78 player, preferably with the right kind of acoustic “speaker.”). The closet I come to imagining that I'm hearing a higher octave string with the low courses on the neck is Dixie Girl . It’s of course possible that Dudley didn’t use the 36-string for the recordings, or got it after they were done, (after 1907). There is also the possibility that he removed some or all of the octave strings during recording for one reason or another. 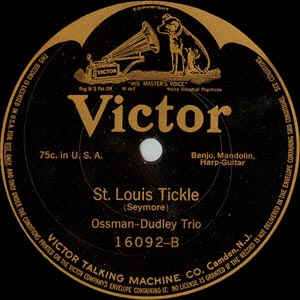 Walsh quotes the 1908 Victor record catalog in describing the trio’s sound: “…the combination has made some extremely pleasing records. The harp-guitar gives a support to the other instruments which is decidedly effective." This doesn’t tell us much either. Remember that the other instruments in the group are Ossman’s bright banjo and a triple-strung mandolin; there hardly seems room for more high strings from Dudley’s 36 octave-strung courses! Sadly, no one knows what became of George Dudley’s amazing Holzapfel 36-string harp guitar, or the brothers’ other instruments. But at least now, we know a bit more about the famous “unknown” Dudley brothers. 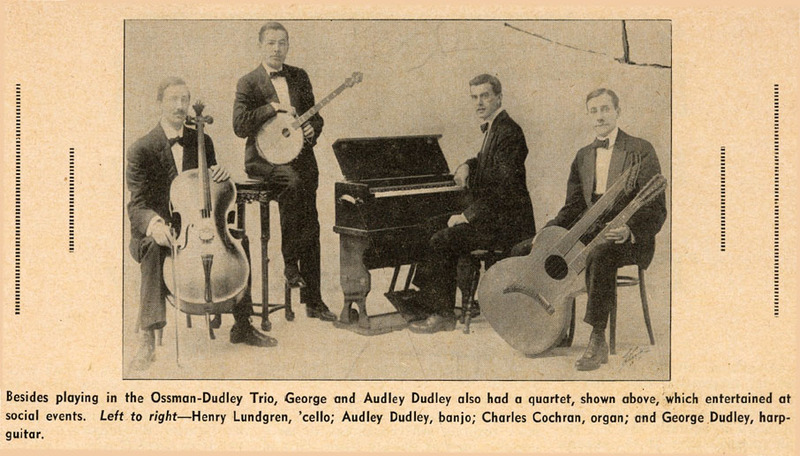 READERS: If you have additional information about George Dudley, the Ossman-Dudley Trio, or their instruments, please let me know!